This home was designed for a young couple and their growing family. 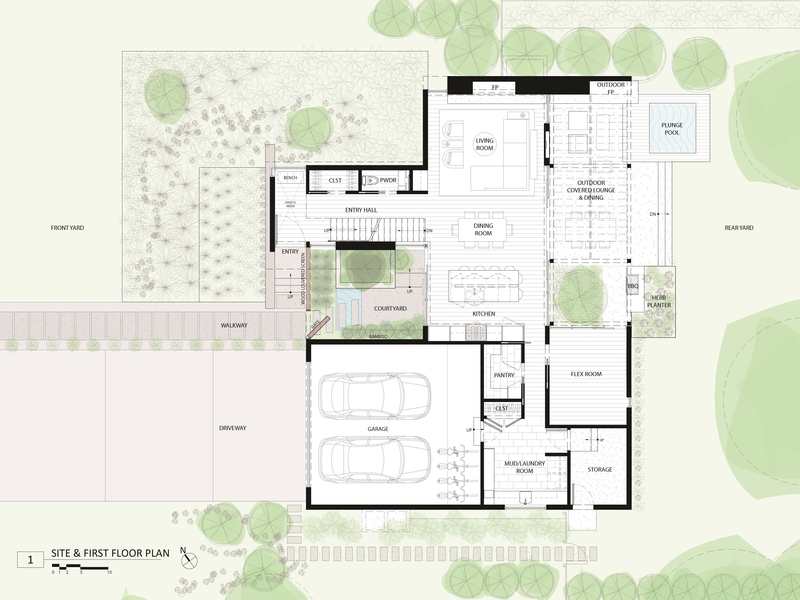 The design concept was to create a light-filled home with integrated outdoor space and the openness of the urban loft where they had been living. Program requirements included kitchen with island seating, reading loft, private master suite with balcony, three additional bedrooms, spa-like bathrooms, flexible space to serve as playroom or office, and private terrace with fireplace, plunge-pool, and pergola. The design is organized around a courtyard enclosed by glass walls in the kitchen and great room, and a rear terrace is accessed through oversized glass doors. The effect is a seamless transition from interior to exterior spaces. The great room is anchored by a linear fireplace with cantilevered concrete hearth that extends out to the terrace, visually unifying the interior and exterior spaces, and the underside of the hearth is notched for linear LED that further emphasizes the connection between the spaces. The kitchen opens to the courtyard, a calming space landscaped with birch, bamboo, Hakone grass, and cascading concrete platforms with a water feature. 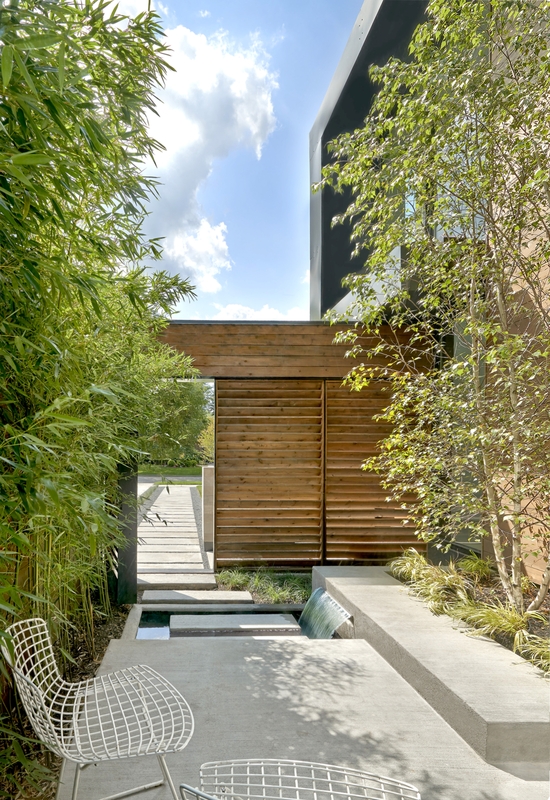 Located between the entry and garage, the courtyard is integrated into the facade with a wood louver screen and gate that offers privacy while filling the house with natural light. The home is located in a residential neighborhood, offering abundant light exposure but challenges to privacy. 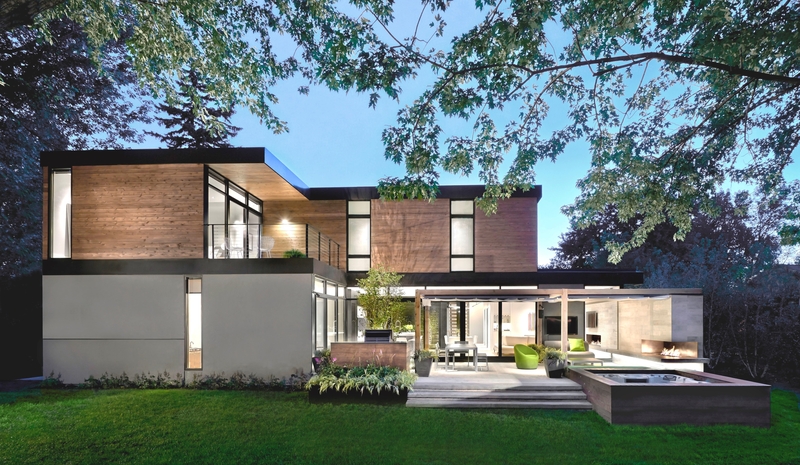 The entry to the home is a double-height glass space oriented perpendicular to the street to maximize light while preserving privacy. The second level is accessed by a sculptural staircase with a center steel support, floating hardwood treads, and a minimalist vertical stainless steel cable screen. Sustainable elements include durable and recycled materials, high efficiency mechanicals, a tight thermal envelope with high-efficiency windows, and drought-tolerant native plantings.